Tidung Island Urban Village, South Seribu Islands, currently has six waste banks. 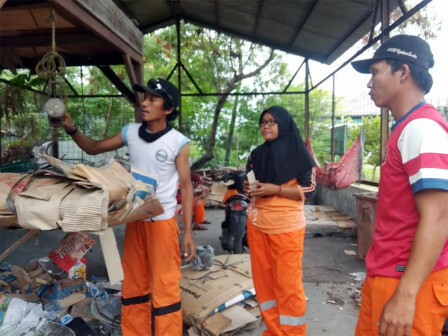 Those are Punaga Jaya Waste Bank at RW 01, Kelor Indah Waste Bank at RW 02, Ilalang Senja Waste Bank at RW 03, Uringin Bersih Waste Bank at RW 04, Teripang Waste Bank and Tiber Waste Bank in Tidung Island Urban Village.
" We want to add more waste bank in our region to realize a clean environment while improving creative economy for the locals"
"We want to add more waste bank in our region to realize a clean environment while improving creative economy for the locals," stated Tidung Island Urban Village Head, Cecep Suryadi, Wednesday (2/6). He wants residents not only produce the waste but also utilize it to increase their income. According to him, waste volume in Tidung Island Urban Village reaches 25-30 cubic per day. He considered to add more waste banks thus waste management could be improved by sorting and reusing the waste materials. "Last year, we earned Rp 18 million from selling used goods through waste banks in urban village," he mentioned. He also encourages schools to provide waste banks. Currently, there are two schools in Tidung Island that already have it: SMK Negeri 61 Jakarta and SMP Negeri 241 Jakarta. "This year, those schools are planned to participate in healthy school competition," he said.